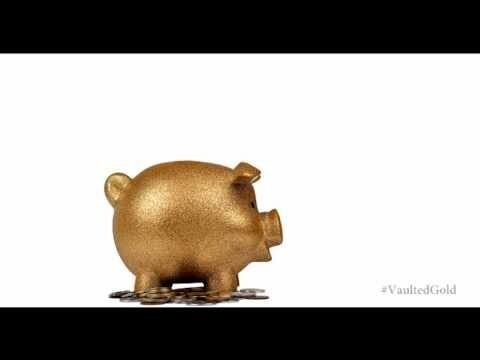 Vaulted gold provides investors real and outright ownership of gold bullion in combination with the advantages of a modern investment product such as low costs and high liquidity. Traditionally, the product has primarily been offered to a very wealthy clientele by private banks, e.g. in Switzerland. With the emergence of new providers in the past years, vaulted gold has become accessible to other private investors. Vaulted gold means gold bullion or physical investment gold stored in professional vaults. As with small gold bars and coins, investors in vaulted gold have a legal right of ownership in their gold. Professionally vaulted: The gold is centrally vaulted by a reputable security services firm or bank. Similar to other investment products like investment funds, the vault operator should be independent from the product provider, i.e. the vault operator should be a custodian (e.g. bank or a vault operator) that safeguards the clients gold. Providers of vaulted gold typically buy gold in bulk in the form of large gold bars. This enables the providers to buy bullion gold at lower mark-ups compared to the premiums usually paid on smaller bars and coins which can be purchased through bullion dealers. Often overlooked costs of physical gold include costs related to the safe storage of the gold. A professional safe is very expensive and may expose oneself to robbery. It is not advised that investors store significant amounts of gold at home without a secure safe. The cost of storing gold in professional vaults is often low, down to a fraction of a percent. This regularly makes the annual costs for storage of vaulted gold cheaper than the annual management fees of gold ETFs (Exchange Traded Funds) which are among the cheapest investment products. Vaulted gold is insured against common risks. Reputable vault operators are accredited, e.g., with the London Bullion Market Association (LBMA), the organization of the professional gold market in London, United Kingdom. Several providers of vaulted gold offer customers a choice between different vault locations, e.g. vaults in Switzerland, Great Britain, the United States and locations in Asia like Hong Kong. Investors can choose one or several vaults to store their gold. This allows investors to own gold in several jurisdictions around the world thereby mitigating potential country risks. Investors, who buy vaulted gold, become legal owners of their gold – they acquire outright ownership. A potential default on the part of the provider does not impact their ownership rights. Vaulted gold will normally be delivered upon a client’s request. With gold securities like gold ETFs, delivery of gold is seldom permitted or limited to very large amounts, e.g. 400 oz bars with a current value of more than 600.000 US-Dollars. Since vaulted gold is normally kept in professional vaults, no verification of the bullion or transportation is required should an investor decide to sell the gold. This feature makes vaulted gold much easier to handle compared to other similar investment products. It enables investors to easily sell their gold holdings at low mark-down prices and makes vaulted gold much more liquid than privately stored physical gold or gold bullion in safe deposit boxes. Many investors will want to sell their gold someday, be it for consumption purposes or other reasons. And every investor wants at least to be able to sell it in the future without any hassles or a high discount. In the past, vaulted gold was generally only offered by exclusive wealth managers or private banks. Today, a range of banks and non-banks worldwide are also offering vaulted gold to retail clients. A potential investor would be well advised to compare different providers before choosing an offer.